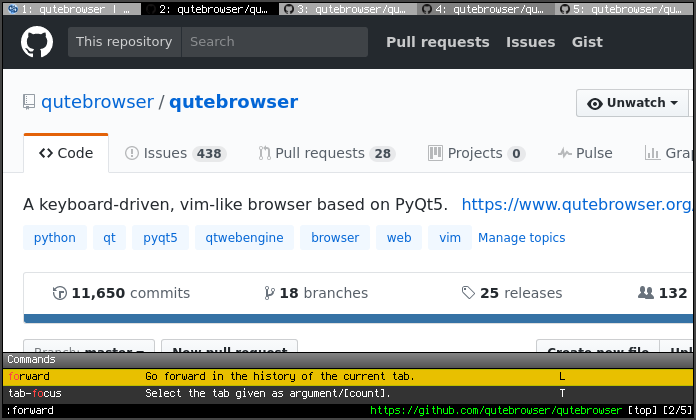 We now have qutebrowser-1.5.1 in the test repository. It can use either the somewhat aged qtwebengine that's part of Stretch's Qt5-5.7.1, or the newer 5.212 qtwebkit5 package I've also backported to the test repository. Interesting, gonna have to try it. Thanks. No joy here. Cannot find the newer 5.212 webkit5 package. Might be the NZ repo again so will try again later. You can download and install libqtwebkit5 from here if the NZ repo still has trouble. Most users will only need the lib package, but KDE users might also need to upgrade the qml-module package at the same time.